Black Rose Skull Martini Glass will make an elegant addition to your Halloween party table and makes a great keepsake. 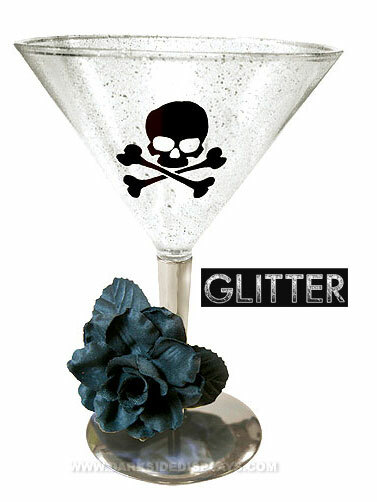 Clear plastic martini style glass with silver glitter flecks features a black Skull & Crossbones print. The silver stem base is adorned with a black fabric rose. Black Rose Skull Martini Glass holds 8 oz of your favorite cold beverage, and measures 6.5"H.